Noysky Projects presents Let's Play War!, a solo exhibition by Nathan Vincent that examines the origins of American male violence in children’s game play. Originally conceived for the Bellevue Arts Museum, Let's Play War! 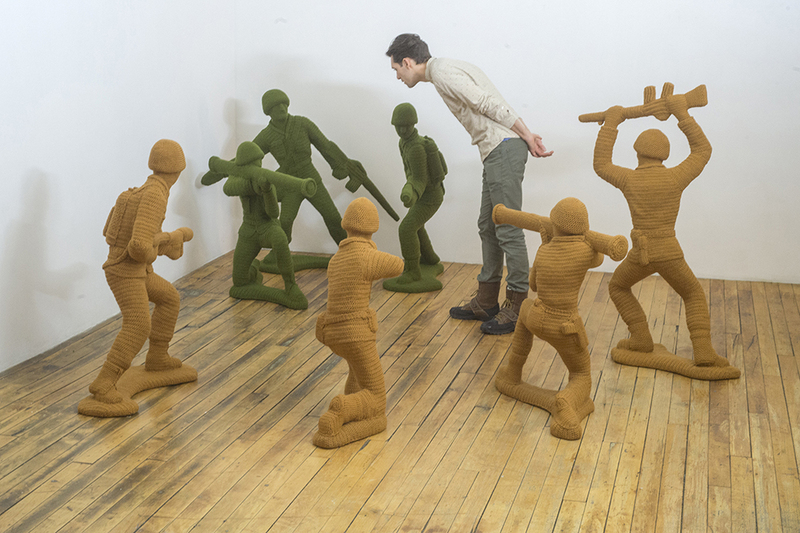 is an immersive installation containing a squad of crocheted, child-sized sculptures based on the likenesses of plastic army men. Children often learn gender roles through play, using pint-sized avatars that promote society’s ideals and aspirations. Their relative scale to the toy also allows them to explore the adult world in safety while giving the child a sense of power over the object. As an adult navigates through Let's Play War!, they are confronted with a grown-up version of a toy that exhibits various levels of violence, dominance, competition, and anger — details that are minimized on a smaller scale. But contrary to the child’s experience of fun and exploration, the adult viewer is made to feel a sense of dread and anxiety as they are confronted with the dramatic scene. By using accessible materials and iconography, Vincent juxtaposes a hyper-masculine fireteam of army men with soft crocheted yarn — a stereotypically feminine medium. Let's Play War! fosters a duality that exists outside perceived stereotypes, exploring deeply embedded codes of conduct while highlighting some of the challenges to overcoming toxic masculinity. Nathan Vincent is a Los Angeles-based artist who has exhibited around the United States and Europe. His work has been featured in prominent publications like the New York Times, Los Angeles Times, New York Magazine, Huffington Post, and Fiber Art Now. He received his BFA from SUNY Purchase, and has been a resident of the Museum of Arts and Design, New York, and BCA Seven Below Arts Initiative, Burlington, VT.